Bruce Marshall is a dark, smiling man, fundamentally serious, four-square in appearance, definite in manner. He has a great fund of pity for humble, toiling people whose virtues are seldom proclaimed, a vigorous and delightfully malicious humor, and a savage dislike of bullies, stuffed shirts, humbugs and toadies. Many of my favorite stories involve priests: G.K. Chesterton’s Father Brown ; dear Mr. Harding in Anthony Trollope’s The Warden ; Father Tim in the Mitford books and Father Tim novels ; Brother Cadfael in Ellis Peter’s medieval mysteries ; the priest in Jon Hassler’s Dear James . Father Smith is a Catholic priest in Presbyterian Scotland, a priest who prays daily for Scotland’s conversion. I don’t think I’ve ever read a novel with such a strong emphasis on Catholic theology, and, at first, I found it off-putting. But I discovered that I appreciated many of this humble man’s thoughts. I think any conservative would appreciate the struggle to hold on to the old ways. When he had been a boy himself, Father Smith had longed to be grown up, because he had believed that it would be easier to obey our Lord as an adult than as a child, and he had been disappointed when he had found it was more difficult. When he was happy, Father Smith always sang snatches from the psalms as he walked the street. Always remember that you can’t see into other people’s souls, but you can see into your own, and so far as you really know there is nobody alive more wicked and ungrateful to Almighty God than yourself. …and those who weren’t weeping had a great distress on their faces because they knew that a great clumsy slice of man who had known all about God’s mercy would walk among them no more. The book opens at the start of the twentieth century with the priests wondering how to respond to the first cinema in town. Father Smith baptizes two babies, whose lives we follow throughout the story. When the Great War begins, Father Smith works on the front line as a chaplain, hearing confessions and praying over the dead. 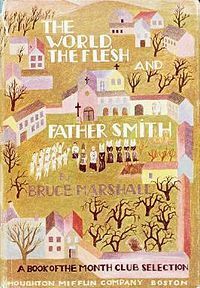 His bishop predicts a spiritual revival will come out of the war, but Father Smith finds reality to be much different. What held my attention was Father Smith’s grappling with the tension from the static doctrines of the church and the rapidly changing culture. I learned a host of Catholic nomenclature: sedilia (stone seats for the clergy), asperges (the rite of sprinkling Holy water), pyx (the container that holds consecrated bread), and pro-Cathedral (parish church temporarily serving as cathedral). I wish I could remember who recommended this. I found it absorbing reading, but I have no desire to read it again. The cheerful humility makes me want to explore another book by Bruce Marshall.